Le Club Accorhotels is offering 500 bonus points for stays of two nights or longer in Hong Kong between May 12 and June 30, 2014. This offer is valid at any of the five Accor affiliated hotels in the city. Seems that this offer is not tied to any special rate that you need to book (at least couldn’t find anything on the T&C’s). I have had a reservation for the ibis Hong Kong island once or twice, but haven’t make it there yet. Did stay once at the Novotel that is quite close to the airport. If you have a stay coming up in Hong Kong and you are going to stay at Accor property, you may as well collect the bonus points as well. 1. 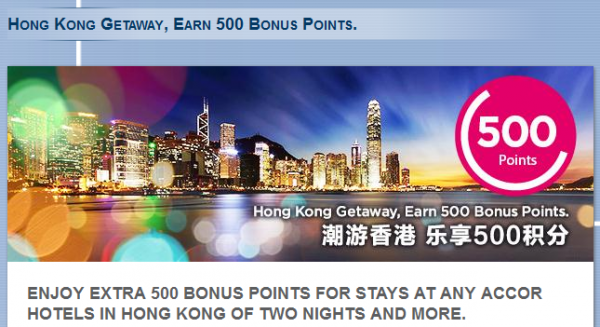 General Le Club Accorhotels terms and conditions apply to the “Hong Kong Getaway, Earn 500 Bonus Points” offer. 2. Offer is valid for stays with an arrival date between 12 May 2014 and 30 June 2014 for all stays booked in the same period. 3. This offer entitles Le Club Accorhotels Loyalty members and Accor Advantage Plus members, regardless of their status, to be entitled to the chance for extra 500 bonus points. 4. 500 bonus points are credited to member’s account without point acceleration. 5. 500 bonus points only applicable for stays with minimum two nights or more. 6. You must book your stay ahead of time online on accorhotels.com or the official brand websites of the participating hotels or by calling the reservation centers. 7. Must provide loyalty card number or member number at the time of booking. Member card must be presented at check-in. 8. Points will be credited to member’s account in 10 days after check-out. 9. Reservations that include several rooms covered by the same member during his or her stay are only counted as one stay. 10. Offer cannot combine with any other offers, promotions or discounts and is not valid for groups. 11. Offer is subject to availability. General sales terms and conditions apply for public rates specific to each hotel.